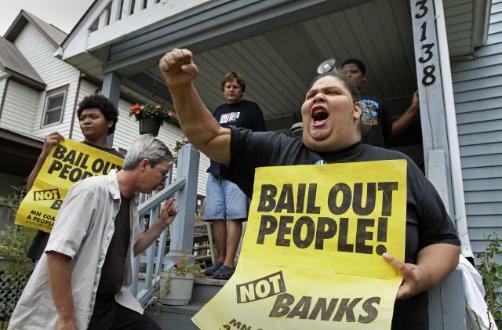 After the authorities evicted a Minneapolis woman who staged a months-long, public fight to stay in her foreclosed home, dozens of activists broke into the house, opened it back up and helped her move her belongings back in. Labour unions at KGHM in Poland held a two-hour strike on Tuesday to protest a government proposal to sell a 10 percent stake in Europe’s second-biggest copper producer. Approximately 19,000 taxis in Honduras joined the general strike late last week, asking for the return of Manuel Zelaya. In Greece, nearly 600 immigrant detainees are on a hunger strike protesting the Greek policy of transporting migrants from the cities to remote places before deportation. Some 2000 property tax collectors staged a sit-in in downtown Cairo demanding job reforms and a halt to what they called a crackdown on their independent union. In Australia, aboriginal elders and families from Ampilatwatja have set up a permanent protest camp outside their government-controlled community in protest against policies that have neglected their needs and desires. In Yemen, over 60 illegal Sudanese immigrants – now detained in Amran’s Central Prison – started a hunger strike protesting the silence of the respective authorities towards their plight. Shops, schools and businesses were closed across much of Indian Kashmir on Tuesday as separatist groups observed the first anniversary of a prominent Kashmiri leader’s death, who was killed when police fired on a protest march he was leading toward Pakistan’s portion of divided Kashmir in the disputed Himalayan region. Hundreds of students from Nigerian universities yesterday marched through the streets of Lagos in a peaceful protest demanding that the Federal Government sign the agreement it had reached with the Academic Staff Union of Universities without modifications. Golden Arrow bus drivers in South Africa went on an illegal strike yesterday after allegations of racism in the workplace.